On Saturday, Oct. 11, 2009, we had a very successful forestry field day at Pleasant Valley Conservancy State Natural Area. 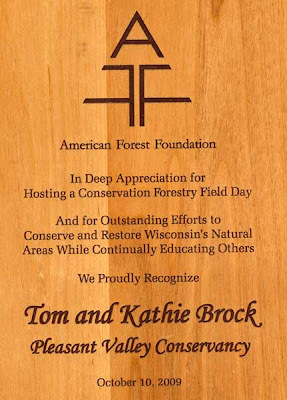 This event, spearheaded by the American Forestry Foundation, was co-sponsored by the Aldo Leopold Foundation, the U.S. Forest Service, and the Wisconsin Department of Natural Resources. 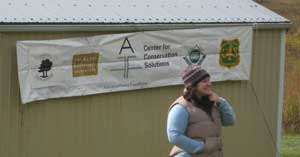 Emilie Cooper (photo), prescribed fire manager for the American Forest Foundation, was the organizer and prime mover. Carol Winge, adminstrator for the Prairie Enthusiasts, handled the reservations and registration. The event was to encourage landowners to manage their property for conservation. A major focus of the event was to encourage use of prescribed fire as a management tool. The group was divided into two groups, each of which moved from one "station" to another around the Conservancy. At each station, a presenter discussed some aspects of the program, using the surrounding oak savannas and oak woodlands as examples. The presenters were Bob Wernerehl (formerly ecologist for the Blue Mounds Area Project), Brad Hutnik (forester with the Wisconsin DNR), Rich Henderson (fire ecologist with the DNR), and Steve Swenson (ecologist with the Aldo Leopold Foundation). Including the speakers, 76 people participated. 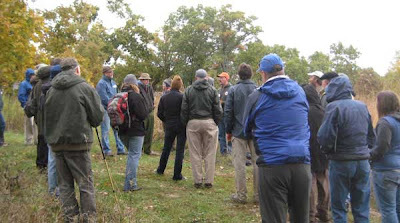 The photo below shows Brad Hutnik discussing the management of oak forests, and the importance of prescribed fire. 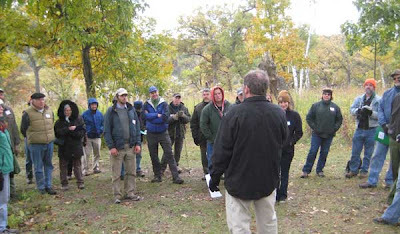 Rich Henderson (photo below) of the Wisconsin DNR discussed his extensive research on fire effects in oak ecosystems. The all-day event began with donuts and coffee at 9 AM, and was followed by lunch in the Pleasant Valley Conservancy barn. Most participants remained after lunch to talk with the presenters and among themselves about the program and their own oak woodlands. In all, a great day.